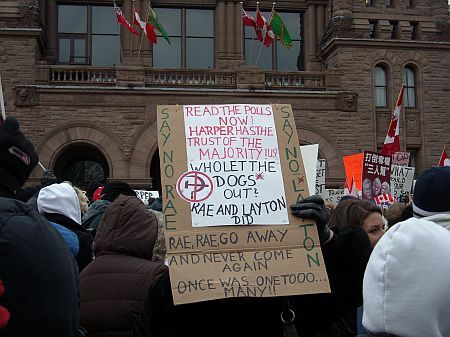 Fortress Of Freedom Board :: View topic - Anti-Coalition Protest At Queen's Park! 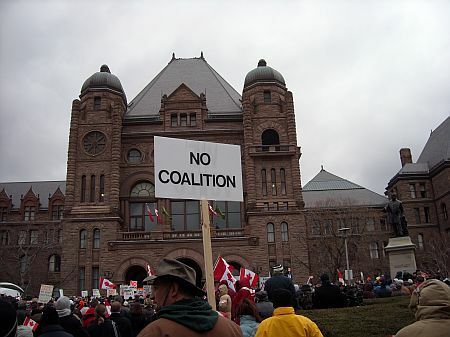 Anti-Coalition Protest At Queen's Park! Posted: Sat Dec 06, 2008 7:02 pm Post subject: Anti-Coalition Protest At Queen's Park! Anti-coalition protestors gathered at Queen's Park today on the sixth of December 2008 to voice their displeasure at the three Federal opposition parties trying to band their forces together and topple the reigning Conservative party and replace the Prime Minister with Stephan Dion who is the leader of the Federal Liberal Party. They are using quite legal means in Canada's parliamentary system to do this so Prime Minister Harper used those same tactics to suspend Parliament until next January. 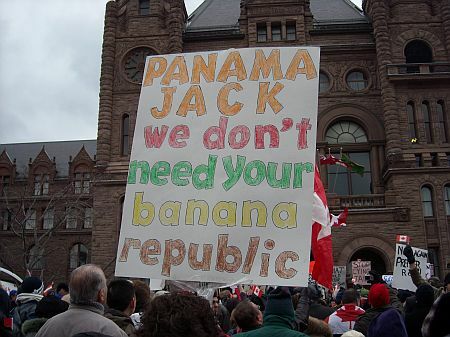 The protests were to be the last chance Canadians would have to voice their displeasure at the underhanded tactic they say the opposition parties are using to gain control. 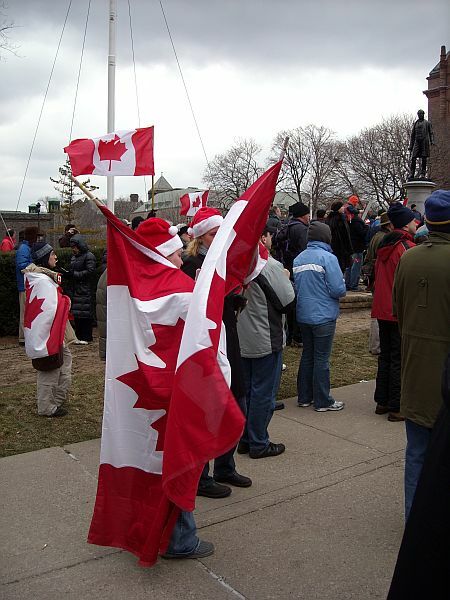 This gathering was more homegrown than the very professional protest of coalition supporters at Nathan Phillip's Square just a short walk south. 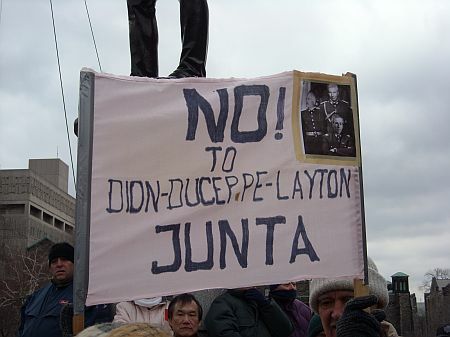 These folk were just average people afraid their vote and country were being stolen from themselves by a socialist (some would say communist) back group headed by NDP leader Jack Layton and backed by Stephan Dion leader of the Federal Liberal Party and with former NDP provincial leader Bob Rae now vying as Dion's replacement. 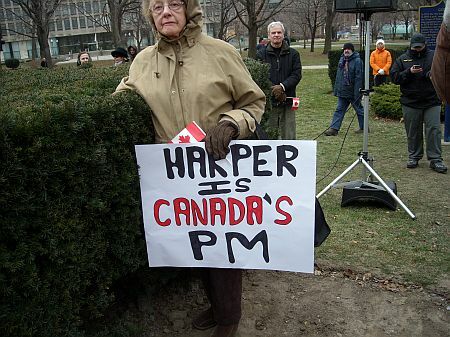 Many state the whole "Fiasco" made Canada look like a "third world country" and we all deserved better. They also hated the idea of the Block Party who's purpose is to separate from Canada having the say so on all decisions or even whether the alliance continues to exist. The only speaker of real note was Provincial Conservative Party leader John Tory who gave a well received speech to the crowd of over 1,000 people. It was very cold today and a quick dash to Starbucks to warm up. I am sure the crowds for all sides would have been much larger if it wasn't for the biting cold of that day.